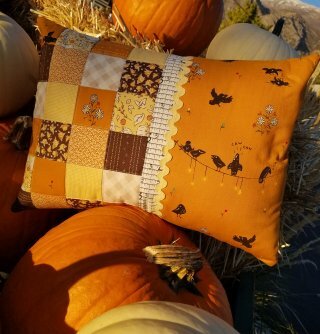 Three short months ago, Corn Wagon Quilt Co. kicked off its first ever Saturday Sampler Mystery Block-of-the-Month with Amy McClellan and let me tell you, we are having so much fun learning about new techniques, tricks and tools with all 265 of our club members! Can you believe we are already a quarter of the way into the quilt? 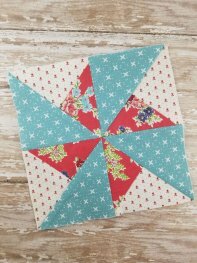 With 20 blocks now complete, we’ve learned how to make 5 classic block styles using some products that have changed the way I piece quilts! I thought it might be fun to share some of the indispensable tips I’ve learned so far through Saturday Sampler but first, did you know there is now a place on our website where you can view the mystery blocks as they are released and see what cool new products we are featuring each month? Simply hop on over to our website and click "classes." From there, scroll down and click "Saturday Sampler." There you can find updates as well as rules, dates and block images. Of course, to receive pattern instructions and kits you need to be registered for this block-of-the-month but we hope this addition to our website will be a helpful resource especially for those participating from afar. 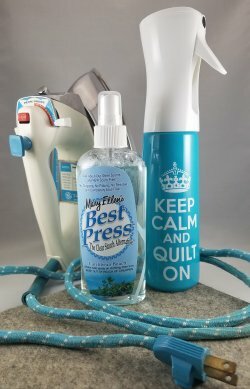 PRESSING: I’ve always been a fan of Mary Ellen’s Best Press spray starch (Caribbean Beach is my favorite fragrance) but haven’t always been consistent in starching my fabrics before cutting (I hate to waste it!). Amy recommended starching before cutting and I’m happy to report it makes a huge difference in how my fabrics handle. And where have these fine-mist spray bottles been all my life?! They not only allow for better spray control, but also make the Best Press last longer so I don’t feel like I’m wasting anything! I plan to buy the stuff by the gallon and simply refill the spray bottle. Saves money and helps the environment. We currently have a variety of sprayer styles and Best Press fragrances in stock. Amy also introduced us to Wooly Felted Ironing Mats. These mats set your seams beautifully, allowing the heat to move more evenly through your fabrics. You’ll only need to press one side of your blocks and your seams will lay as smooth as if you’d pressed both sides! Try ours out and pick one up in store today! SQUARING: Let me preface this by saying I am not usually a girl who has to collect all the newfangled notions that appear on the market. I’m perfectly happy with my familiar rotary cutter, basic ruler and standard cutting mat. They work and there is nothing wrong with them... but I finally broke down and picked up a set of Bloc-Loc squaring rulers. I’ve heard many friends swear by them so I gave them a shot. They are a game changer for squaring half square triangles! The groove in the ruler fits right over your ¼” seam making it easy to square blocks precisely! Those little rulers paired with one of Sue Daley’s Rotating Cutting Mats cut my squaring time in half! Whatever your preference, we have what you need! THREAD: If you’ve tried Aurifil thread you already know why it’s our favorite. It’s smooth, strong, comes in wonderful colors and creates less bulk in your seams and less lint in your machine. It’s not cheap but it’s so, SO GOOD! Did you know buying it in a cone size saves you a bundle? One Aurifil cone at $48.99 has as much thread as 4.5 regular size spools at $13.99 ea.! It's the equivalent of getting one whole spool free! We recommended it for this project in color 2310, knowing we were going to go through plenty of thread in a great neutral color. If your machine is like mine and doesn't have a cone holder attached, we have two different styles of free-standing cone holders available. And finally... Are there even words for a quilt so beautiful? How about just WOW! 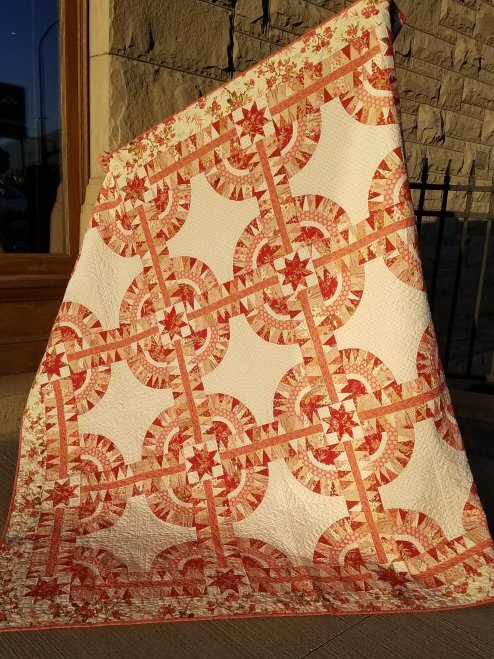 That's all I could say when Suzanne Adams finished this exquisite Honeymoon quilt designed by Edyta Sitar of Laundry Basket Quilts using her Little Sweetheart fabric collection. If I remember right, Suzanne's words were, "What was I thinking!" Tee-hee... I know exactly what she was thinking because I want to make one too! Gorgeous custom machine quilting by Ramona Sorensen accentuates every detail. Kits and yardage available at the shop. Monday, October 22nd - 25% off ONE CUT OF FABRIC! 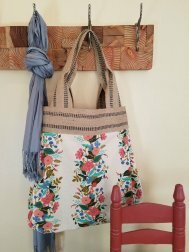 Wednesday, October 24th - - 5-8 p.m.
A great go-anywhere bag, the Elite Tote by Kenzie Mac is as versatile as the fabric you choose. Sturdy jute webbing used to finish the top and handle give it a unique, natural look and make it especially fast and easy to put together. 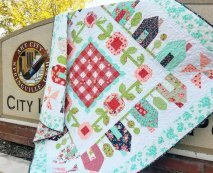 Saturday, October 27th - - 1-7 p.m.
We can't wait to sew Thimble Blossom's new Springville quilt together with you in Springville, UT! 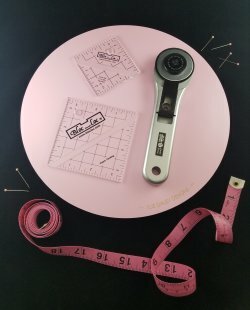 Purchase a kit at the shop and bring it to our retreat center this Saturday for a unique hometown sewing event!